Gets your noses to the monitor- check out those seams- its like a couture sun! Mild concern that these are lace culottes- chafing level 10 people, but look at that jacket with it!!! Oh- sailor collar- I must see that dress under there!! 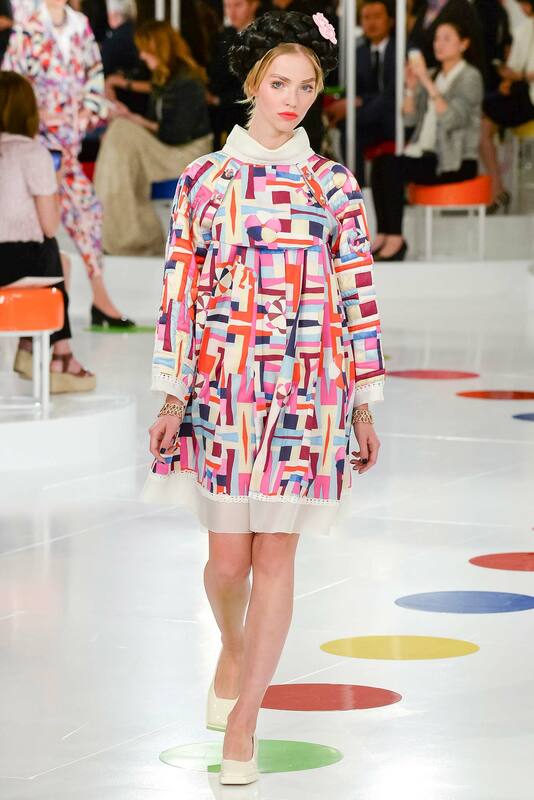 Anna Wintour- please tell me that the Vogue Cafeteria staff are wearing this, I want that to be true. Ok, Karl- drink another diet coke, you are getting light headed. There are 96 looks in this collection- please go see it all! I hope she doesn’t keep her pearls in the fridge. Aw gees- Karl, stop- I get it, you win! LOVE LOVE those jacket collar/neckline shapes. Very glam! They make me want to experiment with boucle! Ew no. Too grannyish for my tastes- adds too much bulk as well imo. 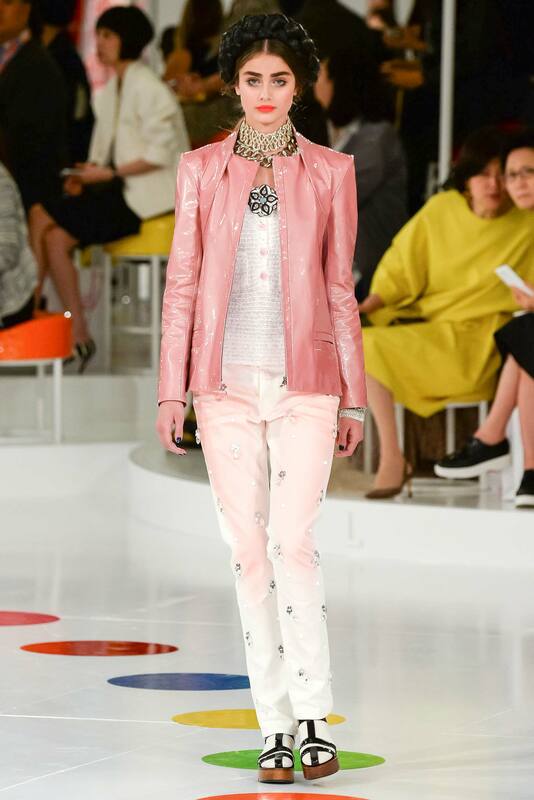 I’m not a fan of the good old classic Chanel jacket personally [and I know many love them]. I’m already square and boxy, a boxy jacket would turn me into a hypercube! I’m over the square Chanel jacket too- I’d be a well upholstered pear- but these are making me giddy! I miss the snark but you’re right. So many fabulous details especially those jackets. The wig hats were a big target, but the rest woo’d me! Just gorgeous. Even the slightly kooky & quirky is gorgeous. As always, totally hysterical – loved the pearls and fridge comment. I was overwhelmed by the specialness! No time for snark with such exquisite tailoring and fabrics! The jackets and coats are superb! Can we start making some of these jackets? Boucle lust! These are interesting. Mostly in a good way. About that sailor collar dress and jacket… Looking closely at the front of the dress, I’m thinking it’s probably a good thing she’s wearing the jacket. I’m having lots of special feelings about the shoulders of most of these! This is so classic and quirky- no staid dog show lady suits here! Oh My! Yes. damn, I wanted to snark too, but so much love – those sleeves, those collars! even the over use of pink was just right – damn! 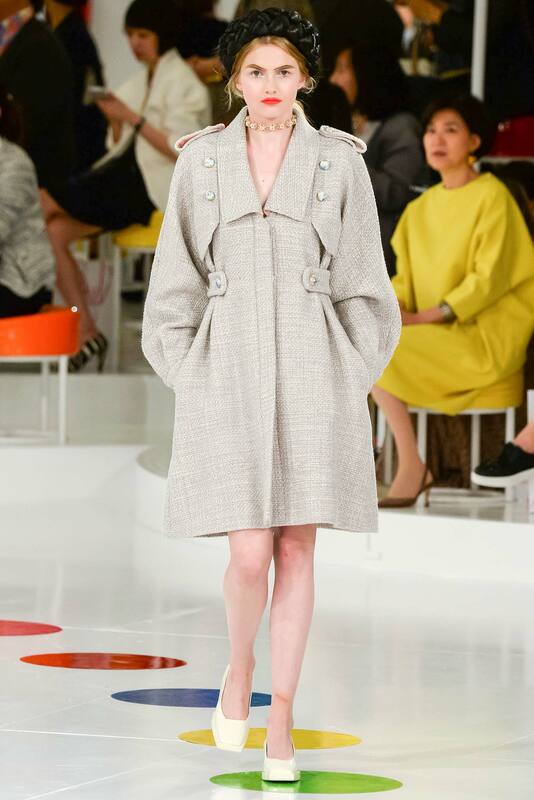 and that neutral coat, and the jackets… ok.. I’m going now… but the weird scary clown eye makeup and princess leia meets minnie mouse head buns, they were wrong. The hair hats were my biggest issue!! Wow. Some kind of beautiful. My favorite is the multi-quilted stripe jacket, the one over the silver lace dress. Yes! Yes! This is jacket nirvana! Ok, there are things in every piece that I like – well, I would do up the buttons and not have so much chest showing! But those are beautiful fabrics and the construction is so detailed! Very beautiful! Yay for lower heels, too. It always seems like the accessories and makeup are the most bizarre parts of a show. I love that blue dress. I want to say I’ve had something similar before. I love the shoes! I don’t think I’ll buy a hair hat tho….. But if it matches, how will people recognize what I spent on my head?? Silly me- but maybe they have Chanel logos on them. Oh wait- please God no!!!!!!! Like a 3rd eye…..of style! Such an ideas factory, and each outfit finalised, so that you don’t scan it for parts you’d change. Its true- I’d love it all- chafing not withstanding! 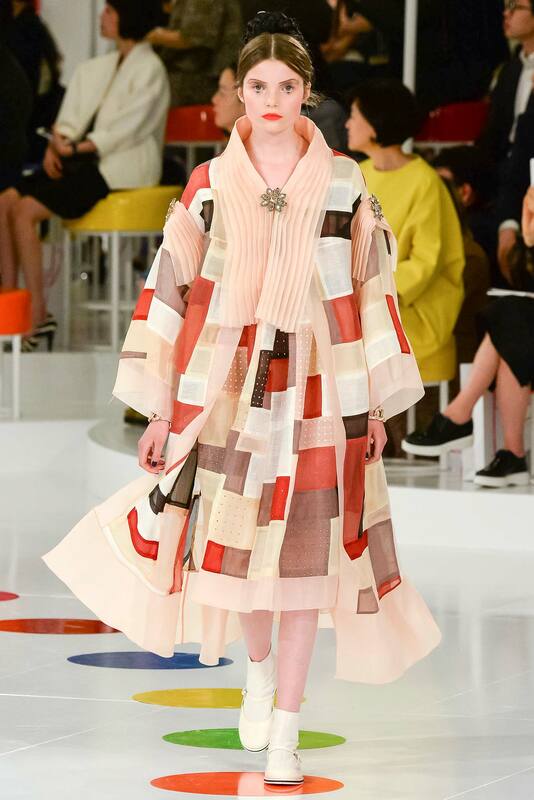 NOTHING better than a CHANEL show 🙂 So much fabulousness and true design, style, craftsmanship…Ahhhh…the fashion world is restored. Love the fabrics (well, most of the fabrics – at least you can appreciate the pairings), interesting details and shoes, too. 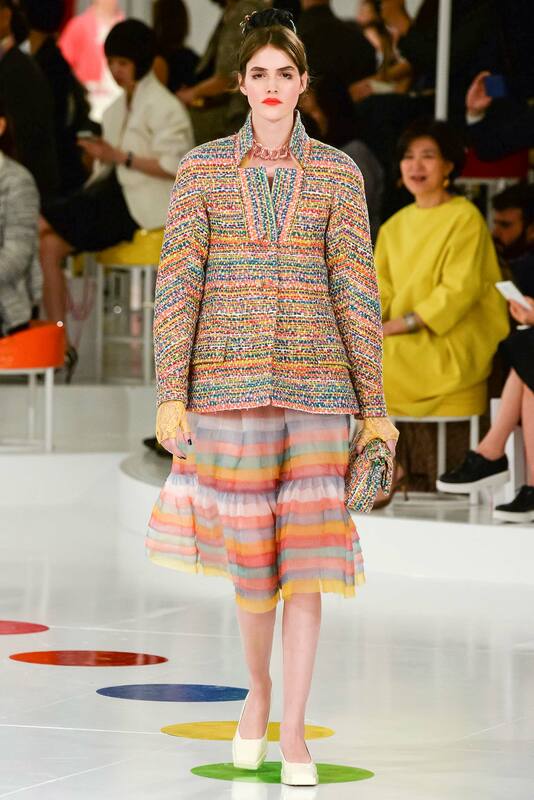 I liked the last CHANEL runway better (OMG…those incredible embellished pieces!! ), but this is very interesting. 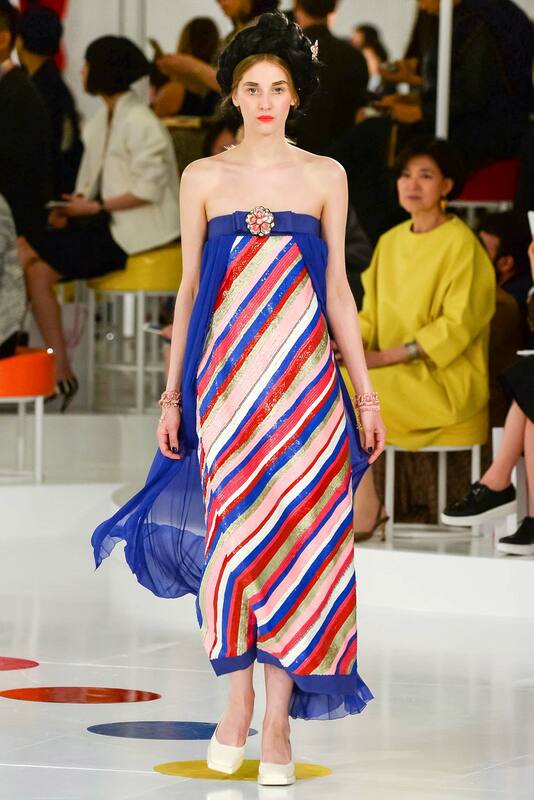 Must look up the Carolina Herrera runway now – another designer whose runways I always love. Perfection in cloth! But the eyebrows???? Its a weird Baby Jane doll thing- scary! I love the colour palette too, bright but not twee. Oh, and the Twister Mat runway, “left hand, red”. I wish I would win the lotto so that I could buy some of these…. Unfathomably love the silver lace clown jumpsuit outfit! Loving the models too – they’ve nailed this look. The lace jumpsuit is a *must have*. The model doesn’t have thighs.